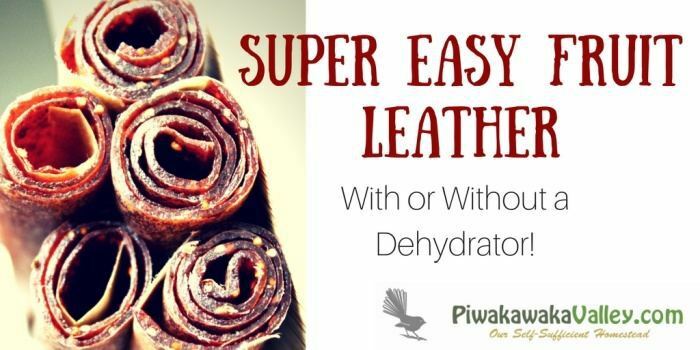 Super Easy Fruit Leather – With or Without a Dehydrator! My kids love fruit leather, they call it fruit candy! Fruit leather is probably the closest you can get to a natural candy that still has some benefit to you thanks to the fiber and the vitamins. The sugar is optional, we used very little with ours as the apples that we used were very sweet. If you are making your fruit leather with just tart berries, you may want to add a little sugar to taste. We recently held a medieval feast with our local homeschool group and the girls wanted something authentic but yummy to sell at the market that we held at the beginning of the feast, just before the mock battle, of course. This was also a chance for our girls to use the wild blackberries that we picked during the summer on another homeschool trip out to a local beach. The rule with our markets is that the children have to had made their own wares. They cannot sell second hand items, and they must have priced their own items as well. Each child has $5 at start of the market, and they learn all sorts of things about running stalls. It is an amazing learning experience for them. My girls loved learning to use our apple peeler/slicer. It is a GREAT invention! Obviously I helped them with the hot bits, but they pretty much did this whole thing themselves. They are 8 and 6. So if they can do it, you can too! We dried ours in the oven, but if you do have a dehydrator that you would like to use, you can do that too. The Excalibur dehydrator is on my wishlist. It is the ultimate dehydrator system but it is a bit pricey. You can get cheaper dehydrators that work well too though. This is a great way to use up the fruit pulp from making jelly. Super Easy Fruit Leather - Without a Dehydrator! A natural treat for kids and adults alike. Fruit leather can be made in the oven with pretty much any fruit combination that you like. Here are instructions on making fruit leather both with and without a dehydrator. Or 10 cups of any fruit combination. Choose at least one fruit with lots of fiber as this is the structure of the fruit leather. NOTE: Alternately you can use pulp left over from making juice or jelly. You will need 1-1 1/2 cups per sheet of fruit leather. if this is you, jump right in at step 9. Place your apples and berries and about 1 cup of water in to a large pot. Bring to a boil and simmer until softened. Taste the mixture, if it is too tart add a little sugar. Be aware that it will become sweeter as they dry. Allow to cool. Blitz the mixture with either a stick blender or in a food processor until smooth. Add a little more water if you need to to get it to mix well. Tip all the mixture into a tea towel or piece of cloth. Tie a knot in the top of the parcel and hook it over a wooden spoon. Sit this over a large bowl to drain overnight. The next day line 2 cookie sheets, or the racks from your dehydrator with baking paper.If you are doing it in a round dehydrator, ensure you cut your paper in a donut shape to allow the air to move up through the middle. Spread you pulp 1/8-1/4 inch thick (3-6mm). Place in a low oven 180F (80C) for 8 - 12 hours. The length of time depends on how much water is left in your pulp and how thickly you put it on the sheet. You will know it is done when the mixture looks shiny and is no longer wet to the touch. You can lift the leather off of the paper and check the underside too if you are unsure. Once cool, roll up the paper and slice the fruit leather in to slices. Add 3/4 teaspoon of gelatin to each cup of liquid and make a jello. Use the liquid to make jam jelly and use the left over pulp to make the fruit leather. 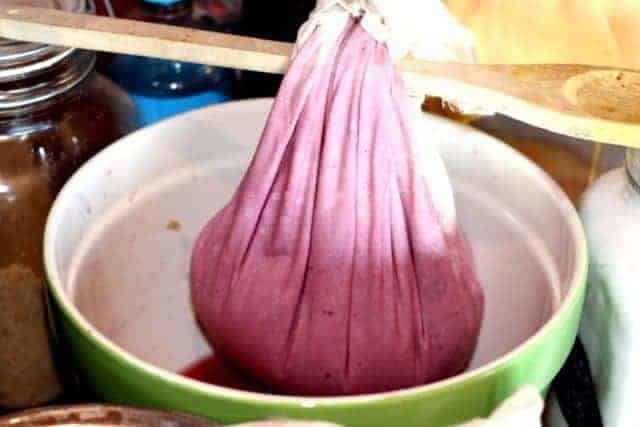 Store the leather in an airtight container for 3-4 weeks. Do you make fruit leather? What is your favorite flavor combinations? Tell me in the comments below.